Airbus exhibited an ACJ319, operated for VVIP charters, at the ABACE show , highlighting the trend toward larger cabins in the business jet market and the benefits that a top-of the-line aircraft offers in this important market. Derived from the world’s most modern aircraft family, Airbus corporate jets feature, as standard, many innovations that other business jets lack or only offer as options, such as the simplicity and better handling of fly-by-wire controls, extensive use of weight-saving carbon fiber, and time and cost-saving centralized maintenance. Airbus’ ACJ320 Family, comprising the ACJ318, ACJ319, ACJ320 and ACJ321, are unique in delivering the widest and tallest cabins of any business jet, while fitting into similar ramp space. 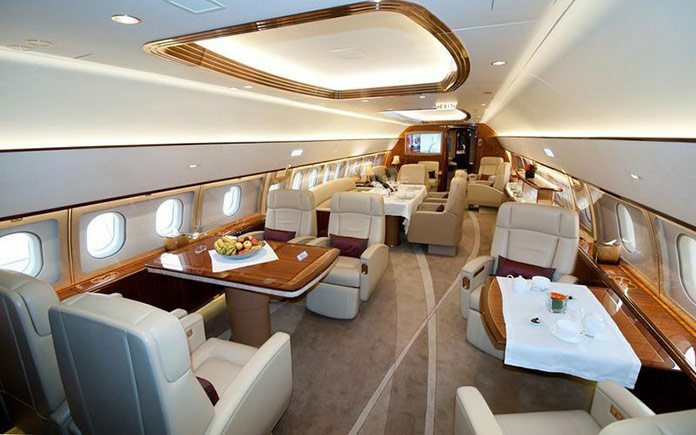 The ACJ319 features conference, dining and lounge areas at the front, plus two separate rooms at the rear. It is certificated to transport 19 passengers – more than traditional business jets – allowing it to serve a wider range of business needs. “The industry trend is toward larger cabins at the top end of the business jet market, something on which we are well placed to capitalize, because we have the widest and tallest cabins of any business jet,” explains Airbus Chief Operating Officer, Customers, John Leahy. “So whether a company wants to bring in customers for a special event, to shuttle employees among sites, or to transport a multi-disciplinary team, Airbus corporate jets are a practical solution,” he adds. Airbus’ corporate jets are derived from the world’s most modern airliner family, enabling them to deliver benefits lacking in older designs. These include fly-by-wire controls that provide enhanced ergonomics, practical protection, and enable the common cockpit that is part of all Airbus aircraft produced today. Others include greater use of weight-saving materials, cost-saving centralized maintenance, and energy-efficient aerodynamics and propulsion. Other standard Airbus features include Category 3B autoland that enables flights in foggy conditions, an intrinsically modern design that holds its value better than older designs, and an unequaled customer-base that encompasses more than 11,000 A320 Family aircraft.